This sweet and simple 5 night Kenya safari itinerary offers guests a vision of pink flamingos at Lake Nakuru, while also inviting them to enjoy the majesty of the Masai Mara. 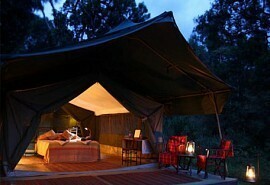 Starting at Mbweha Camp in Lake Nakuru National Park, guests are welcome to explore the wide ecological diversity. This area is home to large protected flocks of lesser flamingos, which turn the lake a vivid pink. It is also famous for its pelicans, black and white rhino, colobus monkeys, as well as, numerous antelopes, buffalo and giraffe. From the Great Rift Valley to the Masai Mara, guests move on to Kichwa Tembo Tented Camp, which places them luxuriously in the path of the Annual Migration, guaranteeing an exciting safari. 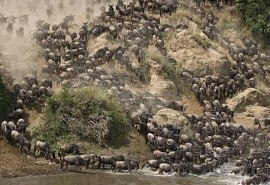 A terrific combination of destinations in Kenya, this is bound to be a memorable safari holiday. From US$2500 in low season to US$2970 in high season per person sharing. Tucked away in the spectacular vastness of The Great Rift Valley in the 6400 acre private Congreve Conservancy, Mbweha Camp is nestled up against the southern border of Lake Nakuru National Park. Mbweha is the Kiswahili word for jackal, and the naming of the lodge is representative of one's ability to find all three species of jackal in East Africa here in the Congreve Conservancy. This is the perfect setting for bush walks and bird watching with 300 species of birds identified in the area and the abundance of plains game. Mbweha Camp consists of 10 cottages built of lava stone with thatched makuti roofs, which add glamour and style to its contemporary African ambience. Every cottage is surrounded by Candelabra Euphorbia, yellow barked Acacia and other indigenous trees that provide a relaxed atmosphere as the sounds of the African night come to life. 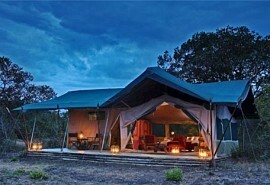 This is where guests will spend the first two fabulous nights on this Kenyan safari. Nestled below the Olooloo Escarpment of the Great Rift Valley, Kichwa Tembo Tented Camp is one of Kenya's best loved safari lodges. 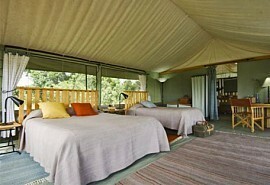 The camp is situated on a private concession leased from the Masai landlords on the western border of the Masai Mara Game Reserve, directly in sight of the Annual Wildebeest Migration between June and November. Kichwa Tembo Tented Camp offers luxurious accommodation in 2 small and intimate camps each offering only nine tents with wooden doors and a private viewing deck. 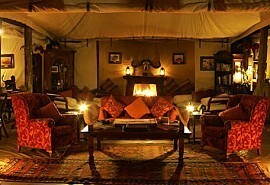 The main guest areas at Kichwa Tembo offer a cool retreat underneath the trees; a sitting area with fireplaces and a veranda overlooking spectacular views over the busy Mara plains. 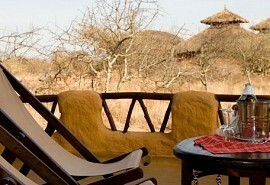 This is a stunning venue to spend the latter 3 nights of this simply beautiful safari.